On November 15, 1918, twenty-five DAR members, led by appointed Chapter Regent Elizabeth Harrison Starling, organized the thirteenth DAR chapter in Florida. After careful consideration, the members voted unanimously to name the chapter after Mrs. Starling’s aunt, Sallie Harrison, the eldest daughter of Georgia patriot Edward Harrison. During the 1930s and early 1940s, the chapter placed eight historical markers at sites in Sanford. In 1941, friends of the late General Henry S. Sanford, on behalf of his daughter Carola Sanford Dow, approached the chapter. Mrs. Dow wished to present her father’s valuable papers, historical documents and portraits to the city he founded. In order to build a replica of General Sanford’s library, the chapter raised funds by hosting Silver Teas, antique shows, bridge parties, and garage and rummage sales. The City of Sanford, interested citizens, the Women’s Club and several local banks assisted with this project. In 1956, the Sallie Harrison Chapter saw its dream come true when the Sanford Museum opened at Fort Mellon Park. In later years, trees with dedication markers were placed in the park to honor special individuals. Chapter members and their families donated DAR memorabilia and other historic items which are on display in the DAR room at the Museum of Seminole County History. The Sallie Harrison Chapter sponsored this museum when it applied for and received a special DAR grant in 2011. Historically, the chapter has always been committed to our youth. From its beginning, chapter members have helped support the DAR schools by providing funds, clothing and supplies. Over the years, the chapter has sponsored three Children of the American Revolution societies. The Fort Mellon Society C.A.R. was founded in 1944. It has become an award winning children’s organization. Over the years, the chapter has handed out Flag code brochures and copies of the U.S. Constitution to local schools. Members have supplied schools with new classroom and outdoor flags. The Sallie Harrison Chapter continues to contact and encourage public and private schools in Seminole County to participate in the NSDAR American History, Christopher Columbus and DAR Good Citizens essay contests. A special awards program and tea is held to honor the winners. Each year a patriotic display is placed in at least one county school to celebrate Constitution Week. Members also present outstanding JROTC students in Seminole County with DAR certificates and medals at their annual school awards programs. The United States was still involved in World War I when the chapter was formed. Local Daughters generously contributed to the aspirin fund, bought war bonds and knitted and rolled bandages. They joined the American Red Cross and USO. The chapter has continued to support the military by contributing funds and items requested by DAR military contacts. Most recently telephone calling and iTunes cards were sent to our troops and donations were made to the Paws for Patriots™ project, which provides service dogs to wounded veterans. Donations of clothing, toiletries, and books are collected at meetings and given to residents of the local veterans nursing home. The Sallie Harrison Chapter shows its support within the community by participating in local parades and patriotic programs. 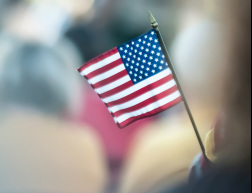 Members have assisted with U.S. naturalization ceremonies and welcomed new citizens. As the chapter continues to grow, local Daughters proudly support the mission of the National Society for historic preservation, education and patriotism.